The Uncurated Life: Drink Natural Suscreen to prevent Premature Aging! Drink Natural Suscreen to prevent Premature Aging! I've been taking the new Snow Crystal White Tomato Colorless Carotenoids for two reasons. It's reach in crystal white tomato and it's a natural sunscreen! Now that I've been trying to be fit and healthy - which I tell is quite a daunting task -, having food supplements like this indeed help. My diet have been pretty clean since I was diagnosed with hypertension so I want to maintain it. I initially thoguht that the Snow Crystal White Tomato is your run-of-the-mill whitening supplement. I wasn't really up for that, I needed everything I take to do more for my body. I knew from experience that if you take in the good stuff, it will make you better inside out. Mere juicing has helped clear my skin off of acne and it came amazing energy. What got me sold on Snoe Crystal White is combination of PhytoflORAL (800mg), L-Glutathione (500mg) and Bioperine. These amazing ingredients gave way to give the body a glow from within look. All natural! What to love about SNOW CRYSTAL WHITE TOMATO Food Supplement is the fact that it acts as a natural sunscreen. The rare crytsal white tomatoes (called PhytoflORAL) has natural UV-filtering capabilities that effectively block UVA and UVB rays. It acts as invicible protection and targets free radicals that ages the skin. With religious intake, the skin will show lesser signs of aging and skin will get fairer. These can only be made from non-GMO white tomatoes so it's impt to know that supplement like this are special. SNOW Crystal White Tomato also contain a combination of Kohji-L Glutathione and Bioperine. This combination has been proven an effective tyrosinase-inhibitor and melanin production. What is tyrosinase? This is actually what makes our skin darker. It triggers hyperpigmentation or pigmentation of melanin that in turn make our skin darker. What Glutathione does is inhibit it provide an overall nutriests to the body. Did you that Gluthathione is also found in liver supplements? That's how good it is for you. One great thing that SNOW Srystal White Tomato offers is an alternative to those who have skin allergies to sunscreen ingredients. More so, how many times in a week do we really put on sunscreen? If you're religious, good for you. I'm glad that science has made it easier for us to protect our skin from the sun for some of us who forgets the importance of sun protection. Sun exposure is the number one cause for hyper-pigmentation, and it hastens premature aging! Good thing Snow Crystal White Tomato is natural sunscreen! Take one or two tablet a day and wait a week to see the effects. Natural sunscreen has been a remedy for many people who are allergic to Titanium Oxide, Oxy benzone and Zinc Oxide. Studies have shown also that some sunscreen ingredients are bad for the skin especially to those with hypersensitivity to the skin. I've come across a few ingestable suncreen but unfortunately many of them are way too expensive and hard to come by. Snow Crystal White Tomato has PhytoFloral that's natural and safe that acts as natural sunscreen. I've been using this the past few weeks and have noticed a good change in the texture of my skin. 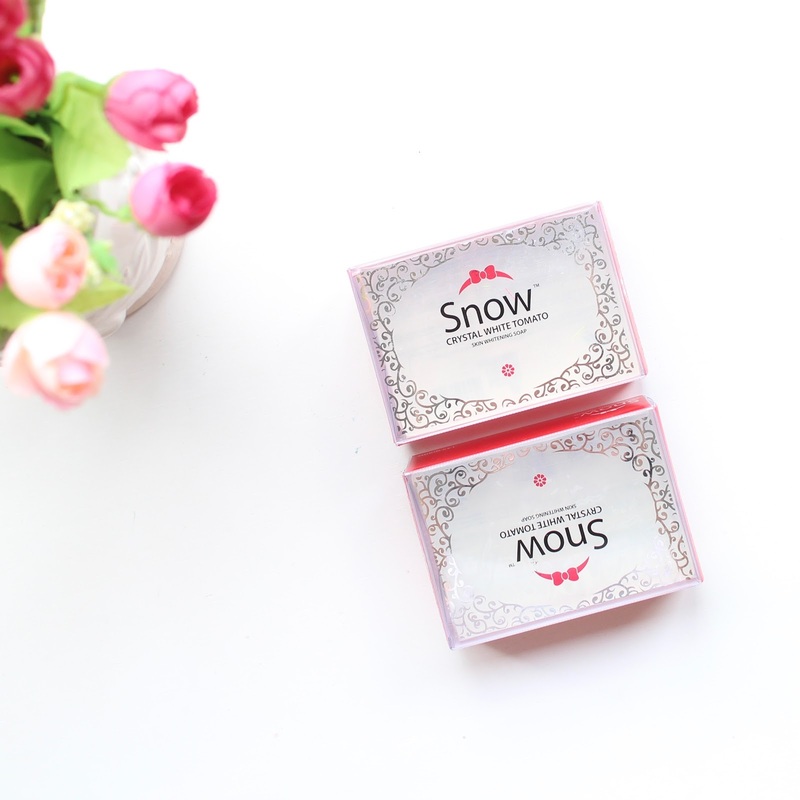 Snow Crystal White Tomato Skin whitening soap is sooo effective at drying up my acne and removing all the dirt and grime of my day. I've been pretty lazy with my skincare routine but because of SNOW my skin looks better. more now. I love the fact that I'm protecting every inch of skin. I still put on sunscreen but I'm not worried about the other parts of the body because we all know that UVA/UVB penetrates even through clothing. The natural sunscreen in Snow Crystal White Tomato allows to feel confident that's I'm protected inside and out. And at a fraction of a cost from other supplements, I feel I'm doing more for my skin now than ever.